Although sales of the United States Mint’s American Gold and Silver Eagle bullion coins showed declines from the seasonal spikes seen in January, monthly sales levels were significantly higher compared to the year ago period. 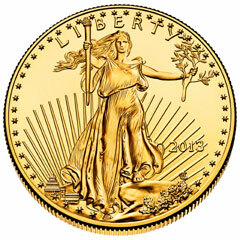 For the month of February 2013, American Gold Eagle bullion sales reached 80,500 ounces, across the four different sizes available. While this was down from the prior month when 150,000 ounces were sold, the amount is nearly quadruple the sales of 21,000 ounces recorded in February 2012. This also marks the fifth consecutive month that Gold Eagle bullion sales have exceeded the level of the year ago period. Sales for the year to date have now reached 230,500 ounces across all options. For February 2013, Silver Eagle bullion sales reached 3,368,500 coins. This amount was more than double the sales total of 1,490,000 which had been recorded in the year ago period. The latest monthly sales figure is down form the prior month total when a record breaking 7,498,000 coins were sold. Typically, sales for the US Mint’s bullion series spike in January when demand for newly dated coins is highest. The Mint is currently offering Silver Eagle bullion coins under their allocation program, which rations available supplies to their network of authorized purchasers. If not for the allocation program, the impressive sales levels for the prior two months would no doubt be much higher. During the month, the US Mint also offered the American Gold Buffalo bullion coins, which are struck in one ounce of 24 karat gold. Monthly sales reached 11,500, bringing the year to date total to 84,000. The Mint continued to sell remaining inventories of 2011 and 2012-dated America the Beautiful Five Ounce Silver Bullion Coins. Monthly sales included 8,440 coins from the 2011 designs and 5,900 coins from the 2012 designs. The US Mint has not yet indicated when the 2013 designs will be available for sale. Next month might be very low with the price hike. The price increases covered earlier this week were for numismatic products. These sales figures are for the bullion coins, which are sold based on the price of the precious metal plus a fixed or percentage mark up. For example, Silver Eagle bullion coins are sold to authorized purchasers in bulk quantities at a price based on the price of silver +$2.00 per coin.